An update during May had already indicated pre-tax profits (before share-based payments) would be no less than £2.5m. I had wondered if TSTL had been ‘sandbagging’ with that May statement, but no such luck I’m afraid. In the end, pre-tax profits (before share-based payments) came in just £87k above £2.5m. 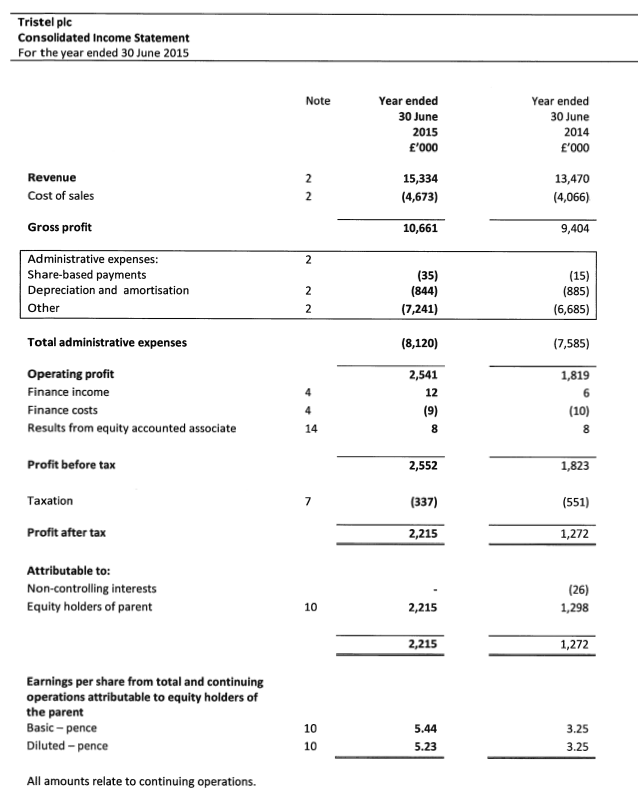 I see TSTL’s £2.5m profit was calculated after i) an £125k loss following the sale of certain intangibles, and; ii) an £81k adverse foreign-exchange movement. So you could argue the underlying pre-tax profit was closer to £2.7m. Anyway, reported earnings were miles ahead of my 4.6p earnings per share guess at 5.4p per share. A full-year tax rate of just 13% (vs 26% for H1) gave a surprise boost to the bottom line. Even on a standard 21% UK tax charge, earnings would have been 4.8p per share — well ahead of published forecasts. Notably, the annual ordinary dividend was much better than TSTL had promised. The firm had previously suggested the full-year payout would be four times the earlier 0.585p interim dividend — i.e. 2.34p. In fact, the actual full-year payout came to 2.72p per share. Importantly, TSTL’s operating margin during H2 was a super 19% — versus 14% for H1 and 16% for H2 of last year. I’d like to think this latest H2 margin performance emphasised the true competitive strength of TSTL’s proprietary cleaning products. I note revenue relating to TSTL’s core products — medical wipes and hospital disinfectants — climbed 13% during H2. Such progress sustained the preceding H1 wipes and disinfectant performance (up 14%) and outperformed TSTL’s veterinary and clean-room products (revenue up between 9% and 12% during H2). For what it is worth, revenue from TSTL’s wipes and disinfectants have surged 97% to £10.7m during the last three years and currently represent 70% of the top line. In other words, orders from the NHS buying agency jumped almost 17%. It was also nice to see revenue from overseas gaining 21% to £5.5m. Foreign revenue now represents 36% of total group sales. All told, year-end net cash marched from £2.6m to £4.0m (10p per share), of which £1.2m has since been used to fund a special 3p per share special dividend. Although TSTL’s cash situation was boosted by £648k following the exercise of options, it seems to me the bank balance can continue to build up nicely without such proceeds. Crucially, TSTL re-confirmed its previous £20m revenue target for 2017 while aiming for a pre-tax margin of at least 15%. The £20m revenue target requires two further years of 14% top-line growth, which looks achievable to me. Meanwhile, a pre-tax margin of at least 15% seems almost in the bag with margins currently above 16% — although I guess margins could depend on just how much the firm invests in new markets. On the subject of new markets, it was pleasing to see TSTL confirm it has “embarked on its United States regulatory approvals project”. One day the US market could be a real money-spinner for TSTL — although product approval remains a few years away yet. But there was no BPR update in these results. I can only assume the associated costs have become not so significant in relation to the group’s burgeoning profits. My sums from February indicated there could have been 46% upside from the then 80p share price. I had expected that upside to be captured over the next few years, not the next eight months — because the price is now 46% higher at 116p! While my portfolio has welcomed that price surge, it does mean the shares are not an obvious bargain. Taking surplus net cash as £2.8m or 7p per share, my estimate of TSTL’s enterprise value (EV) is £45m or 109p per share. Dividing that 109p by my aforementioned 4.8p per share earnings calculation, the trailing cash-adjusted P/E comes to 23. Using TSTL’s 2017 targets of £20m revenue and at least 15% margins (and applying the new 20% UK tax rate), I feel earnings could be at least 5.8p per share within two years. After dividends, I reckon such profits in 2017 could have then added a further £4m, or 10p per share, to the cash pile. 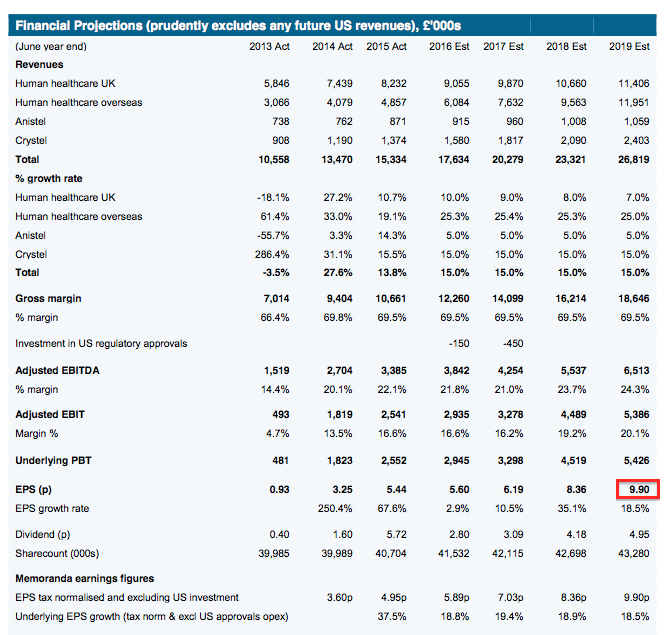 If these projections come good, then a 116p share price — and an EV of 99p per share — in 2017 would value TSTL at 17 times my estimated profits. That rating tells me there is some expectation of growth beyond 2017. I am not inclined to forecast profits any further out, because such extrapolations generally come with too much risk and can easily persuade me to overpay for growth that never materialises. All told, I am happy to let my TSTL holding run for now. The business appears to be performing very well and the promise of revenue (one day) from the US ought to keep the valuation elevated for some time to come. * Next event: Ex-div on 19 November, 2.135p final dividend paid on 18 December, AGM statement in mid-December. Pleased all my questions were asked during this session. Must thank Equity Development for hosting this and other webinars. * Low tax rate: Due to relief on i) final tranche of overseas losses, ii) R&D and iii) share-option exercises. Was not made clear whether low rate will continue. * Cash level as of “this morning” was £3.4m. Implies last 3.5 months produced cash of £0.6m after adjusting for special dividend payment. * New clinical areas: Ophthalmology cited as example of rapid growth area. Treating eye-care instruments had never been consider by TSTL until a few years ago, but now growing rapidly. Other clinical areas could provide same potential. * Australian distributor: Country approved wipes system for ENT and ultrasound 4 years ago. AUS distributor now selling AUD$2m of product to hospitals, generating revenue to TSTL of £650k. “Matured distributors” general are a “good source of organic growth“. * USA: Submitting Duo foam product for FDA approval. Duo costs 10% of the main wipes system, easy to use but lacks product bells and whistles such as traceability. Going for ultrasound and opthalmology usage. Hope to submit product to FDA by June 2016 and receive approval by June 2017. Approval investment expensed via P&L, will be c£600k. * Costs: Expect to maintain gross margins. Operating costs increased 8% due to greater marketing spend and rising salaries. That £125k intangible loss was indeed a one-off write-off (“a tidying-up exercise“). * Biocidal Product Regulation (BPR): Impacts only surface disinfectant products (i.e. not the wipes) that use non-core (i.e non-chlorine dioxide) ingredients. Spent £135k so far on compliance groundwork, which is part of overall £650k spent by TSTL and (3?) others offering similar products. BPR costs now lower than first thought due to decision to cull older, lower-margin products. Resultant spare machinery and warehouse space will provide extra capacity for main product growth. * NHS supply chain: Growth all volume driven. Prices frozen during current framework agreement of 2-4 years. Confident of NHS growth continuing. * Non-execs: Looking to make another NED appointment with international healthcare experience. Chairman confirmed as chairman and no longer ‘interim’ chairman. Execs seemed happy with board at present. No complaints here. 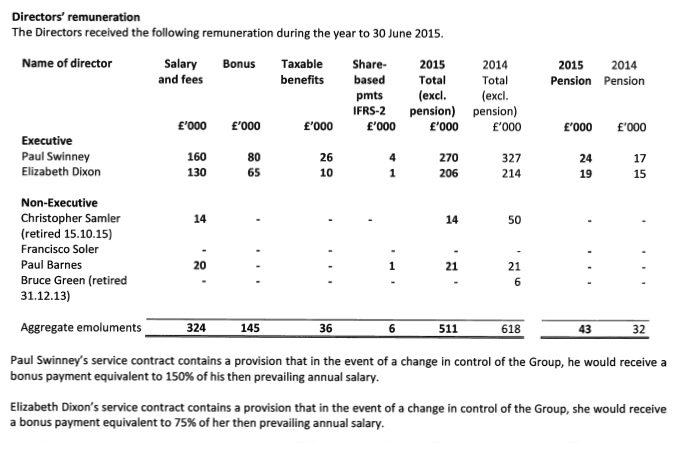 Chief exec’s pay up 9% to £160k and FD’s pay up 29% to £130k (29% is a large jump, but £130k seems a fair FD wage). Bonuses at 50% of salary seem modest given group performance during the year (during the previous year, bonuses were 100% of basic salary). 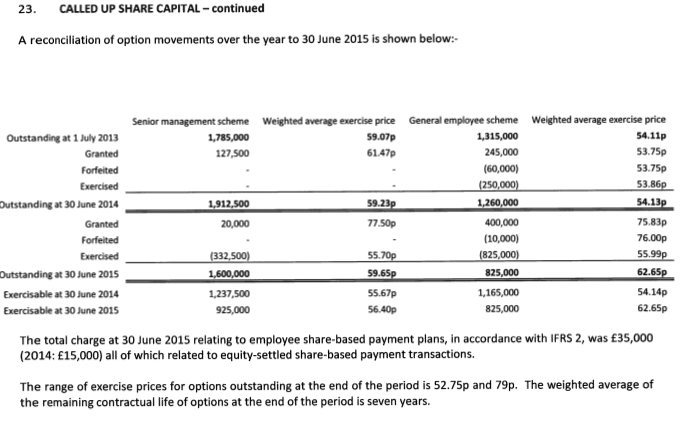 FWIW, the directors still hold 675,000 options with an exercise price of 65p that can be exercised only on “change of control“. Coupled with the “change of control” provision contained within the above director pay details, it seems the execs will not be too unhappy if the ultimate end-game here ends in a takeover.